As an animal lover, there’s one thing that gets me more mad than most anything else, and that is trophy hunting. The idea of killing a beautiful animal, just to pose with its corpse for a photograph, is disgusting and baffling to me. Judging by social media reaction to this story, I think most people around the world feel the same way. A businessman from Georgia has been photographed standing beside two apparently very young elephants, holding a gun. 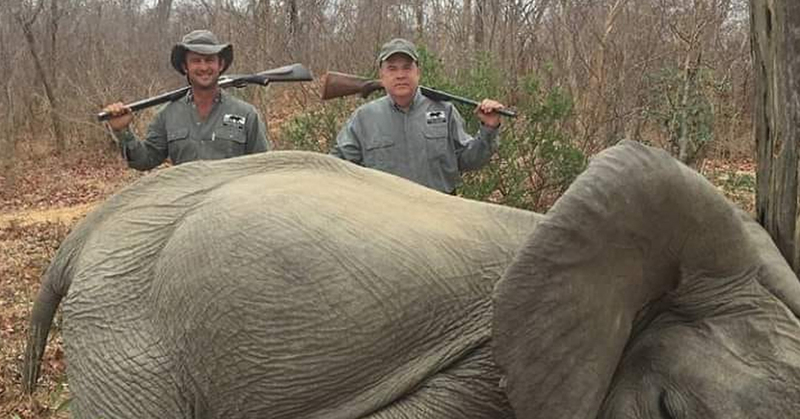 He has been named as TopGen Energy partner Mike Jines, who reportedly shot and killed the elephants while in Zimbabwe, Africa. The alleged hunt took place in October 2018, but the photos have only just come to the attention of the public. It has been alleged that Jines went trophy hunting, accompanied by professional hunter Max Delezenne. “The hunt started with a bang . . . literally. Less than thirty minutes into the first morning of the first day we experienced a double elephant cow charge. He's seriously "Blaming" the poor baby elephant – Claims he HAD TO KILL him – and then poses SMILING for these photos with it's warm dead body. Can you imagine EVER doing business with #TopGenEnergy? Digusting. Massive liability. The upsetting photographs have since gone viral, with many people expressing absolute horror and disdain for the man’s actions. Perhaps understandably, some have called for a boycott of TopGen Energy in response. I have to say, I’m n full agreement here. Jines has claimed he killed the elephants in self-defense, and that the elephants had charged at him. He has also stated the animals were two adult elephants, not babies. Jines – who says he has received threats as a result of the backlash – has stated the events which occurred have been misrepresented. It would seem that most people simply don’t buy his version of events.